Geothermal Heat Pumps, Ground Source Heat Pumps & Ground Heat Pumps are a central heating and/or cooling system that pumps heat to or from the ground. They are also known as geoexchange, earth-coupled & earth energy systems. Ground Source Heat Pumps are one of the most energy efficient technologies for providing Heating, Ventilation Air Conditioning & water heating. 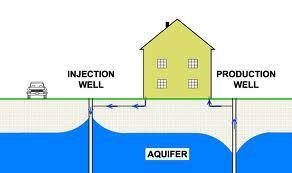 In open loop systems, which are also known as Groundwater Heat Pumps, bore water is utilised in the process. Over time limescale, salts, minerals & iron bacteria bio-films can build-up on heat transfer surfaces dramatically reducing the heat transfer efficiency. WMA 2006 Bore Cleaning Compound can be used to remove limescale, salts, minerals & iron bacteria bio-films from the pipework & heat transfer surfaces. They use the earth as a heat source during the winter or a heat sink during the summer.